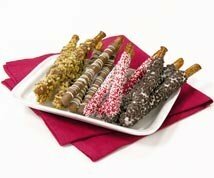 When deciding on a special gift, why not choose Valentine Pretzel Rods? Chocolate dipped pretzels are such a quick and easy candy to prepare, and yet they are so wonderfully delicious. I love that combination of salt and sweet that comes with chocolate covered pretzels. I've added an easy recipe below although I think you'll find that a recipe is hardly needed for such an easy to assemble treat. You may like to order some chocolate pretzel rods as a gift for someone special. If so, here are some for you to choose from. Melt chocolate and shortening in a double boiler over medium heat, stirring until smooth. Chocolate can also be melted in the microwave by heating 30 seconds at a time and stirring each time. Do not overheat. Dip pretzel rod in melted chocolate leaving 1-2" uncovered for a finger hold. Place covered pretzels on a wax paper covered tray to set. Sprinkle colored jimmies on pretzels before the chocolate hardens. You can also refrigerate for 10-15 minutes if needed to speed up the setting time. Wrap your valentine chocolate pretzels in clear cellophane bags and tie closed with a matching ribbon. You can get the cello bags, sprinkles, and even the chocolate at Candyland Crafts. If you keep your chocolate covered pretzel rods out of the heat, these keep well and make a wonderful gift for a special someone or a whole group of friends.